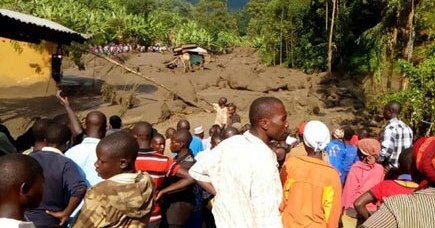 BUDUDA – Twenty people were on Thursday evening confirmed dead, among them primary school pupils, and over 500 people displaced after deadly mudslides buried villages in Bududa District in a repeat of the 2012 incident that buried hundreds following heavy rain. According to residents, the rains came after more than five hours of heavy rain in Bukalasi Sub-county. The floods swept away homes and Suume Junior Academy before dumping the residents and pupils into River Suume that feeds River Manafwa. Most of the bodies were found floating in River Suume by residents who were later joined by police to retrieve them and rescue several others still feared trapped in the debris that covered some of their homes in the mountainous area. Elgon region police spokesperson Manshur Sowedi said the death toll could be higher. “The number of dead people is believed to be more than 50 but we are trying to recover more,” Mr Manshur said in a telephone interview. Mr Peter Kisolo, the sub-county chairperson, said hundreds of residents are homeless. “Hundreds have been left homeless and they have been told to shelter from relatives and friends in the neighbouring sub-counties,” he said. Mr Kisolo said the bridges and roads in the sub-county have been washed away after the river burst its banks. The survivors, some of whom sustained broken limbs, have been admitted to Bukalasi health centre III. Red Cross officials have also joined the search for those missing and are providing relief items for the displaced. The district chairperson, Mr John Watila later visited the scene and describing the disaster as horrible. In 2011 a mudslide in Bulambuli killed about 28 people. In March 2012, mudslides killed six people in Sironko District and in June 2012, another mudslide buried 18 people in Bududa District. Last year, 10 people were buried in Sironko landslide. A mapping survey done by the geotechnical in the Department of Geography, Geoinformatics and Climatic science at Makerere University in 2015, found that a fresh 40km-crack on the slopes of Mt Elgon had developed and warned of looming landslides.